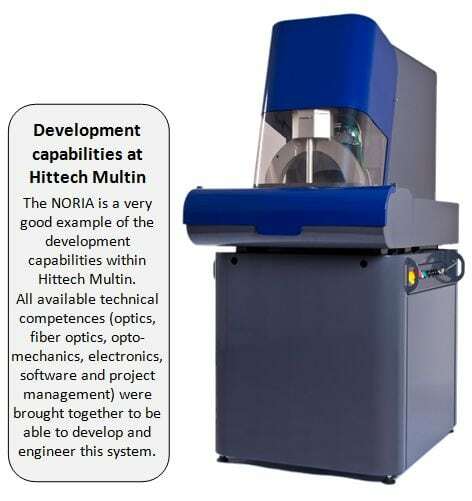 The NORIA, developed by Hittech Multin, enables sensor manufactures to produce Fiber Bragg Gratings in a cost effective and semi-automated user-friendly fashion. 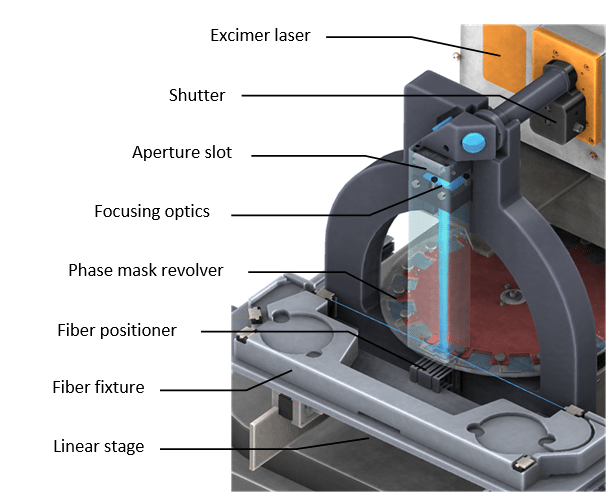 In its essence, the NORIA is a lithography system featuring a Deep UV laser, beam conditioning optics, a revolver disc with 16 selectable phase masks and a novel fiber positioning system. 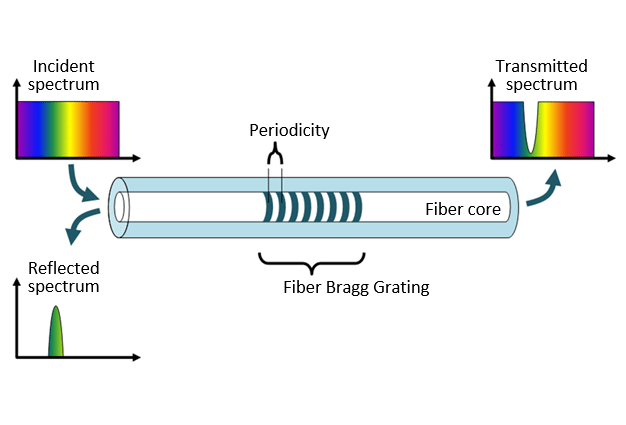 A FBG is a periodic modulation of the refractive index in the core of an optical fiber. Often a FBG is visualized a ‘barcode’ like pattern with approximately 20,000 stripes inscribed over 10 millimeter fiber length. The periodic pattern in the fiber (i.e. FBG) reflects a specific wavelength of light depending on the periodicity of the grating. Changing the periodicity, e.g. by elongating the fiber at the location of the FBG, will result in a shift of the reflected wavelength. Such an FBG is used to measure all different kinds of physical parameters, e.g. temperature, pressure, strain and is often used in harsh environments where conventional (electrical) sensors fail. Deep Ultra Violet light from an ArF excimer laser is conditioned by a dedicated Hittech optical design and focused into the 10 µm core of the single mode fiber. Accurate positioning of the fiber in focus underneath the phase mask in a highly repeatable robust fashion is mandatory for the usability of the system. A special wire-EDM flexure mechanism to pick-up and position the fiber is developed by Hittech Multin. Laser safety for Deep UV radiation. Optics alignment and stability: ± 5 µm over 400 mm optical path. Pick-up of the bare fiber without scratching it. Position the fiber just underneath the phase mask. Several NORIA systems are currently active at customer locations. We are gathering the user experience feedback from our customers and if possible will be implementing the feedback in future revisions.